You need your hydraulic equipment up and running fast. This means the less time you spend picking out your parts, the better. When you use Oilgear hydraulic power units in Norwalk CA, it’s easy to get all your vital components purchased and installed in one fell swoop so you can get back to business fast. The components in each power unit have been meticulously designed to work together for the absolute best efficiency and reliability. And don’t forget that maintenance gets much easier when you have Oilgear hydraulic power units in Norwalk CA. All you have to do is pop the unit out for service which is easier than disconnecting all kinds of separate parts to get at the one that needs attention. Need To Customize Your Hydraulic Power Units in Norwalk CA? To ensure you get the correct capacity from your Oilgear hydraulic power units in Norwalk CA and meet various system requirements, adjustment or outright customization may be needed. Whether you simply want to get a vertical or in-tank mounting configuration or need your entire unit to be able to withstand unique environmental conditions, Oilgear will give you the flexibility you need. 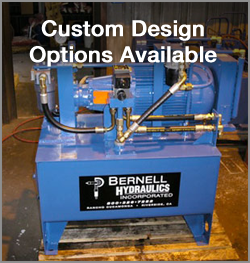 Bernell Hydraulics is a reliable parts supplier, but that’s not all we do. We also offer emergency repair services as well as routine maintenance services to keep your hydraulic parts and equipment working their best. Whether you need help installing new Oilgear hydraulic power units in Norwalk CA, or whether it’s time for maintenance or repairs, we have experienced technicians ready to help.